The Ashby Village Arts & Culture Series provides a unique dimension to Village life by recognizing and sharing the extraordinary talents of our members. 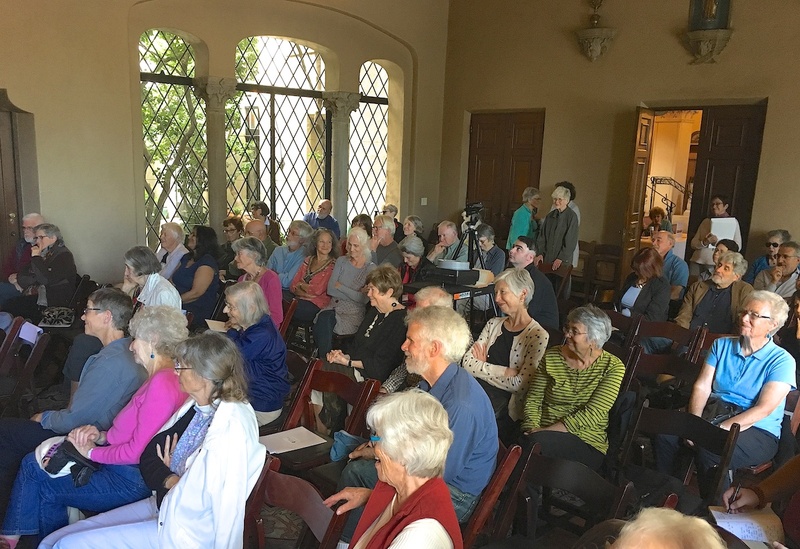 In the latest event, on June 11 at the Berkeley City Club, internationally acclaimed artists, Village members, and long-time friends shared insights drawn from the intersection of creativity and relationship. They spoke in conversation with each other, the audience, and interviewer Naomi Newman, founder of Traveling Jewish Theater. Earll Kingston, known for his distinguished career on stage and screen, related stories from his beginnings as a Berkley high school teacher to groundbreaking writing and meditation retreats for victims of trauma. Judith Foosaner, a visual artist and inspiring teacher at the California College of Arts and Crafts, presented images that explore possibilities of color and line. 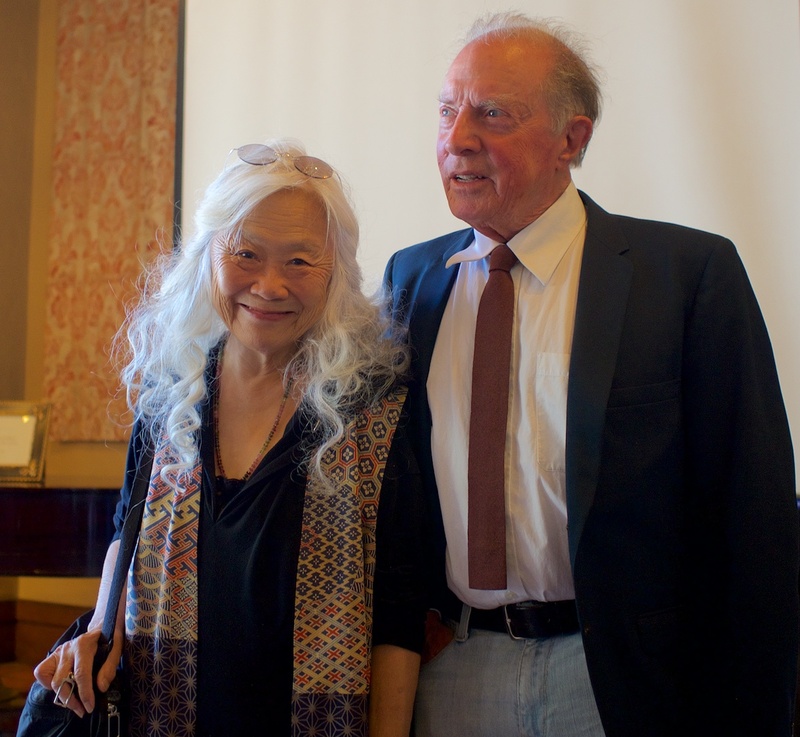 Maxine Hong Kingston, celebrated author of numerous award-winning books, read from work she began at age 65, I Love a Broad Margin To My Life. The book’s title is a quotation from Thoreau that is posted over her desk. Margins, she explained, refer to boundaries, borders. The conversation often turned to the changing boarders that define spaces on the map of a life and how forces of art, friendship, and compassion shape them. Still, each had unique things to say about their creative process. According to Judith Foosaner, “Drawing is a possibility, an explosion of truth that leads out. What appears comes from another place, I enter a new reality. My drawing is from this other place.” At 65, Maxine Hong Kingston took a wide margin in her own life to write in a way that made sense to her at that time in her life, removing her from the constraints of deadlines, and giving herself the space to explore a new creative form. Each found an interface between art and working to improve the lives of others. Judith Foosaner devoted many years to teaching and mentoring. For the past 25 years, Earll Kingston and Maxine Hong Kingston have dedicated their creative talents to meditation and writing retreats for veterans. The retreats create community among participants through sharing and writing their stories. Relationships are forged through continued meetings over time. This is the third event in the Ashby Village Arts & Culture Series. “At Ashby Village, we’re proud and fortunate to have both a rich reservoir of talent and a community that’s passionate about art, culture, and current affairs,” said Marcia Freedman, co-chair of the Village Arts & Culture Series, who works together with co-chair Rochelle Lefkowitz and members Irene Marcos, Betty Webster, and Roberta Pressman. Thanks go out to those who contributed to the success of this event: Tony Paulley, videographer; Steve Tobey, volunteer; Rachel Kahn-Hut, volunteer; Veronika Fukson, Kristina Holland, Alison Colgan, Joan Cole, Outreach Team. The next Arts & Culture event, “Understanding North Korea: A Conversation with Philip Yun", is on Sun 10/15/17 at 3-5 PM at Ashby Village, 1821 Catalina Ave., Berkeley. Yun, ED and COO of the Ploughshares Fund, is former U.S. State Department Senior Advisor for East Asian and Pacific Affairs, who managed negotiations with North Korea under President Clinton and is co-editor of North Korea and Beyond (2006).